NEW DELHI: At a time when Apple is ramping up its India operations, the company's main competitor in smartphone and tablet industry, Google, is missing in action. In the last two years, Google has launched six Nexus smartphones and tablets with its hardware partners but only one such device has made its way to India. Nexus devices, which run unmodified version of Google's mobile operating software, are considered best in their class and are primary competitors for iPhones and iPads. "If I have to buy an Android smartphone now, I will go for Nexus 4. At its price ($299 for basic model) it is an incredible value for money. But even 50 days after it was made available in the US, it is yet to reach India," says Gaurav Shukla, the editor of a blog called androidOS.in. "It is a big issue for smartphone enthusiasts here because only Nexus devices provide 'pure' Android experience," he adds. India is an Android country. "In Q3, 2012 around 3.8 million smartphones were shipped in the country. Of these, 3.01 million, which is over 70% of the market, were powered by Android," says Manasi Yadav, a market analyst with IDC. But Android's success in the country seems despite Google and not because of it. Even Nexus S, the only Nexus device to launch in India, debuted here eight months after its global launch. Recently Motorola, after being acquired by Google, shut down its business in India. Google or its hardware partners evade the questions on the availability of Nexus devices in India. "We're interested in making our products and services available as widely as possible, but we have nothing to announce at this time," a Google spokesperson told TOI. Sources in the industry say the non-availability of Nexus devices in India has to do with the synergy, or the lack of it, between Google and its hardware partners. Another reason is that companies like Asus and Samsung have their own devices in the market and they tend to be cautious with Nexus devices even though they partner with Google for the programme. Take the example of Galaxy Nexus. In a bid to make amends for late Nexus S launch, Samsung wanted to bring this device to India as soon as possible. "The plans were afoot to launch Galaxy Nexus in Indian in December 2011, within weeks of the global launch," an industry insider told TOI. But then the launch was delayed. It became January. Several weeks later the launch was scrapped because the company wanted to focus on its upcoming phones like Galaxy Note. The case of Nexus 7 has been even more curios. 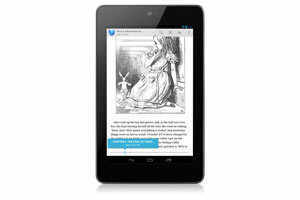 When Nexus 7 launched in July in the US, Asus officials in India said the product would arrive here in early October. Sources say the statement did not go down well with Google executives taking care of Android in Asia Pacific region. Nexus 7 launch was then delayed. On November 7, Nexus 7 magically appeared on the websites of a retail company that runs several electronics stores in India. Asus executives confirmed the tablet had been launched but Google officials looked surprised by the news. But after a few days, Nexus 7 disappeared from the market. Sources within Asus said the limited availability for a few days happened because of a mistake. "The tablet is not launched yet. We are talking to Google about it and will jointly bring it to the market soon," said a senior Asus executive. Nearly two months later, there is still no sign of Nexus 7 in India. Nexus 4, the latest 'pure' Android phone from Google, seems to be going the same way. In early November when it was launched globally, a senior LG executive in India said the device will come here before the end of the month. The company later clarified the person was misquoted. While Android remains popular, the non availability of Nexus devices does damage the brand. "There is a lot of demand for Nexus devices, especially among technology-savvy consumers and smartphone enthusiasts. But when devices get delayed, it forces people to select other high-end smartphones that are readily available in the market," says Manasi. Much of this demand is going Apple's way. In July, Apple CEO Tim Cook said India was not a priority market. But despite his statement Apple seems to have realized that India is important. In 2012, Apple changed its distribution method in India and moved away from carriers like Airtel and Vodafone. It is now using Redington and Ingram Micro to distribute its iPhone. The latest iPhone and iPads became available in India within weeks of their global launch. Incidentally, Apple is also very prompt in launching its laptops here while Google's Chromebooks, despite targeted towards budget-conscious users, are yet to be available in India. "Apple has taken all the right steps in India in the last few months. With a revamped channel distribution structure strategy, more iPhones are reaching the consumer markets now. This gives Apple leverage in the market as it takes on the competition," says Kiran Kumar, a senior market research analyst with IDC. The most important sign that shows Apple now treats India as a serious market is the launch of iTunes store. On December 4, the company announced that iTunes store was available in India, giving consumers here ability to directly buy and consume music, videos and books etc directly from their iPhones and iPads. This is in stark contrast to Google Play store which is yet to launch in India despite a high number of Android users who can make use of it. Apple's renewed focus on India reflects in the sale it is notching up. Its iPhones are now not only available with big electronics stores but also with local shops. A local dealer in a south Delhi market says, "For the last few months we are selling 50-60 iPhones every month. Given their price, we find the numbers fantastic." Kumar believes Apple is doing the retail game for a longer period and hence is more adapt at it. "I think Nexus programme is still in the nascent stage especially in India. Google is slowly rolling it out to more countries and testing how consumers receive the devices," he says. But the delay doesn't help Google's cause in India. "As the market is extremely dynamic with compelling choices, the consumers don't usually like to wait for a device to be launched for too long," says Manasi.